The two local musicians got together to make a concept album, and wound up making the clarinet cool along the way. 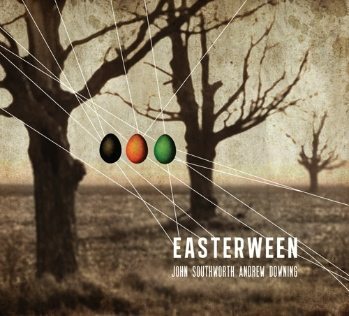 A lot of artists go out of their way to defy genre conventions, but Easterween, the new collaboration between local avant garde musical scientist John Southworth and award winning bassist/cellist/composer Andrew Downing, goes one step beyond that. It doesn’t fit within the confines of any genre currently known to us. It’s its own animal. Southworth calls it as street cabaret, which works, but we prefer to think of it as Dickensian string pop. With poetic lyrics, a narrative album structure, and a penchant for antique sounds, Easterween sounds like what would happen if you added a Greek chorus to a film set during the turn of the last century. Easterween also shows a surprising amount of love to the clarinet. The under-appreciated woodwind gets a lot of play on the album, including a rather klezmer-esque appearance on “Falling in Love with the Old World Again” (which you can hear by clicking play above). Southworth’s creepy sing-speaking vocal style and abstract lyrics round the album out perfectly. His despondent lover routine on “Metamorphosong” is brilliant, as is his sing-song playfulness on “Robert Kirk is in His Lighthouse.” This is a concept album—the plot having something to do with GMOs, 500-year-old magicians, and a mountain in Pennsylvania—but that doesn’t mean that each song can’t be appreciated as a brilliantly weird stand-alone artifact. Between its resurrection of the clarinet, diverse use of strings, and fascinating lyrics, Easterween has a lot to recommend it. The fact that it totally defies categorization will probably turn some people off, but for those who aren’t afraid to challenge themselves, the album is worth a listen.